Autism Society Philippines (ASP) will hold its 12th National Conference and 2nd Southeast Asian Conference on Autism on April 28 and 29, 2012 with theme “LIVING WITH AUTISM: Hope@Home” at Crowne Plaza Manila Galleria, Ortigas Ave. corner ADB Avenue, Quezon City. One of our panelists in “When Disaster Strikes Home” is Mr. Alejandro Cabason, Jr, ASP Marikina Valley Chapter President and a father to Vinz, a 13 y/o boy with autism. "We were a bit lucky that Typhoon Ondoy struck and hit our area at Provident Village around 11AM, unlike in Cagayan and Iligan Cities. But speaking of typhoons and flooding, this calamity is no longer new to me in the first place. Our province (Southern Leyte) often experiences typhoons particularly during "ber" months. In addition, I also had an encounter with flooding while I was on vacation in Butuan City in the early 60's and in Sta Mesa, Manila in the 70's. "Back to Ondoy, when mudded water entered our garage, I knew that something worst is about to happen. For the past 20 years we were at Provident, flooding never reached our garage area. And if there would be flooding, it was purely from rain water and it was always outside our elevated bungalow house. "It was September 26, a Saturday, and I instinctively gave instructions to all my children to pack their most important belongings and transfer to my brother-in-law's two storey house, just beside our house. My three children started packing important things hastily except our youngest son, with autism, Vinz. His innocence-filled eyes just stared with what his siblings were doing. Unlike all of us, he just walk ed very casually albeit carefully without bringing anything except his slippers. As the flood was fast rising, all of us silently kept our fear but never saw that in Vinz. 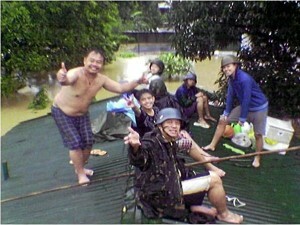 "We also had our share of anguish when the water already reached the second floor of my brother-in-law 's house. But again Vinz was a picture of calmness and serenity. When we decided to transfer to our roof's house via the branches of a mango tree between our houses (so we can be seen by rescuers that never came), Vinz simply followed with us every step of the way. Even when the water leveled at 14 feet, Vinz just stared at the water, and oftentimes asking "his way" of the flooding. "While we adults were preparing for something that we could cling to and help us afloat, Vinz accompanied his siblings praying and reciting the holy rosary. But unlike his siblings, Vinz never had a fear and anxiety in him. In short, he perfected the art often portrayed among believers, he simply knew that God will bail all of us from this natural wrath. "When we decided to go back to spend the evening at my Bro-in-law's attic, Vinz never had a problem peeing unlike us. He just went straight to the window and did his thing. When all us were already uncomfortable because we were all wet including our underwear, Vinz was so relaxed wearing only his uncle's big shirt. "Throughout the ordeal, Vinz never complained and worried. Having autism must be an advantage to most children with autism and with special needs during calamities." Register now to the 12th National Conference on Autism to find out how you can prepare the strike of typhoon. You can email us at aspnc2012@gmail.com or call us at 9266941/9298447 to register. For more details on the 12th National Conference on Autism, click here.